You can choose from an array of gorgeous colors for the exterior of the Wrangler. Depending on the look you want, you can go with no top, a soft top, or a hard top. You can also take the doors off and fold down the windshield, adding a unique appearance to the SUV. 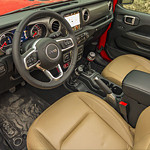 Combine that with the aesthetics of different trim levels and you have a custom look to your Jeep.